The Juicy clan at 3 Ravens continues to grow (at least temporarily until each batch is consumed) with the arrival of the first 2018 variant of the brewery's popular take on the NEIPA style. And it's a variant based around a hop variety perfectly suited to such beers, the fruity as, US grown Citra – added at three dry-hopping stages to the same base beer as the original Juicy, whose evolution you can read about here. So what do you get? 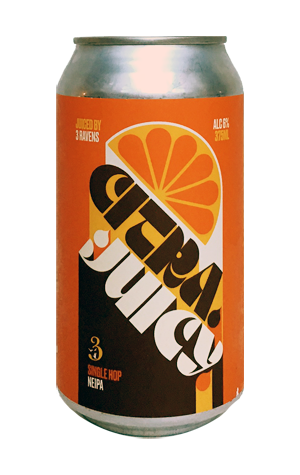 A similarly hazy beer topped with a fluffy white head (inside a darker hued can) that fires off lively, freshly squeezed Jaffa orange juice aromas (with a dash of grapefruit for good measure). Flavours are of the sweet, faintly sticky, citrusy sort, while there's the barest lick of bitterness in its midst too. As with other Juicies from Ravens, it's not as wantonly creamy, cloudy or pillowy as some of its peers. And that's no bad thing.